Ekta Kapoor has finally stepped into motherhood this week through surrogacy. According to reports from the media, Ekta has welcomed a new member into her family on 27th January. The reports also stated that the baby was healthy and the Kapoor family is extremely happy and are prepping up to welcome the baby in a grand way. Ekta Kapoor has followed her brother Tusshar's footsteps by opting for a surrogate child. Tusshar welcomed his son Laksshya into the family on 1st June 2016, and Ekta being his bua was the name who named the child. Well, we are sure she is going to be an amazing mum to her child. She has not shied away from being an affectionate aunt for nephew Lakshaya and pours her heart out for the kid on social media as well. Both the kids of Jeetendra and Shobha Kapoor, Ekta and Tusshar have decided to be single parents. After the news broke out on social media yesterday, the TV producer has finally confirmed the news to her dearest fans with a heartfelt note on becoming a mother for the first time and also revealed the name of her son as 'Ravie Kapoor'. Well, there is a reason behind this name which will make your hearts melt, as she has named her son after her father Jeetendra whose real name is Ravi Kapoor. While making the happy announcement, Ekta wrote, "Please send your love and blessings for lil Ravie!" She went on to describe how excited and touched she is to become a mother and that she just cannot wait to start her new journey with her son. The popular drama creator also said in another post that she had opted for surrogacy after various unsuccessful attempts to get pregnant through Intra Uterine Insemination (IUI) and In Vitro Fertilisation (IVF). The post also confirms that the baby boy was born on 27th January 2019. 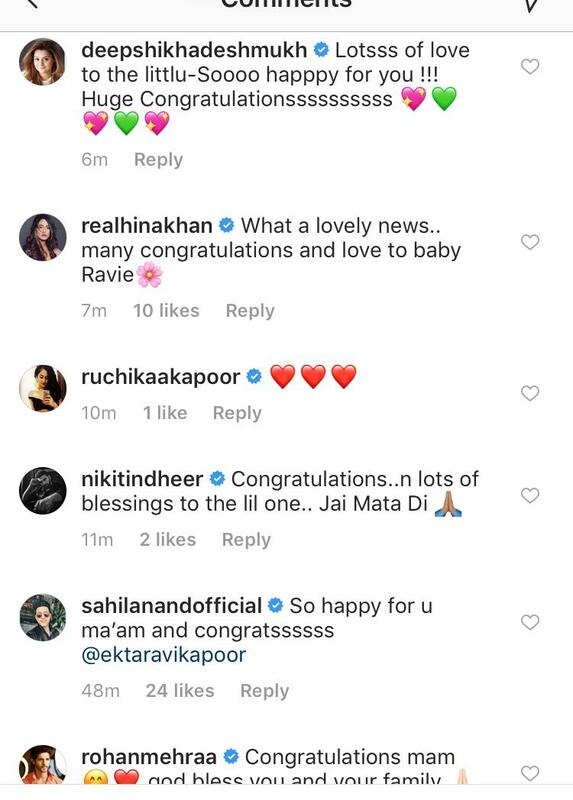 While we were still celebrating the good news in our heads, even before we could think, Bollywood friends of Ekta started sending her good wishes on welcoming baby Ravie. Actresses like Hina Khan, Nimrat Kaur, Director & Producer Karan Johar, Vidya Balan and others shared their sweet messages on the arrival of the son. Other celebrities like Gauri & SRK, Kiran Rao and Aamir Khan as well as Karan Johar have become parents through surrogacy. On the work front, Ekta is getting a great amount of attention on her new show Kasuatii Zindagii Kayy and is also busy producing other TV shows like Naagin season 3 and some upcoming Bolly projects like Parineeti Chopra and Sidharth Malhotra's Jabariya Jodi and more.